Why settle for the copyist when you have so many originals? I had never heard of Anthony Louis Scarmolin (1890-1969): this is one of those CDs from an eBay seller that you add to your main purchase because it sells very cheap and you get postage rebates on combined shipments. Hearing the music, I understand why. Scarmolin was born in Italy in 1890, but his family moved to the US when he was 10. The liner notes say that his earliest compositions “used a fascinating, tortured chromaticism and occasionally crossed the line into what some call atonality”, but that “his early style, contemporaneous with Schoenberg’s early departures from tonality and with Bartok’s String Quartet No. 1, did not survive” the criticism of Scarmolin’s teachers at the New York’s German Conservatory of Music, and that he soon settled to writing a tremendous amount of commercial light music in a conservative style, which he stuck to to his death in 1969. Not that there’s any remarkable evolution in Scarmolin’s compositional style as featured here, either, and the Dance from his 1948 opera The Caliph sounds like one Henry Rabaud could have composed for his own “Marouf Savetier du Caire” (1914), or Saint-Saens, D’Indy or Florent Schmitt for any of their “exotic” North-African or Middle-Eastern compositions, and Prelude, another tone poem and Scarmolin’s latest composition to be featured here (1964) sounds very much in the same lush “fin-de-siècle” (or rather “début” of 20th century) style. 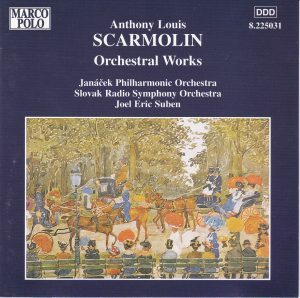 Since the death of Scarmolin’s widow in 1987 a Louis Scarmolin Trust has been established and it has been funding recordings of Scarmolin’s music. 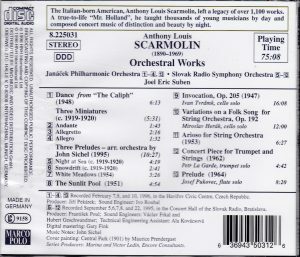 In particular, the same conductor, Joel Eric Suben, recorded Scarmolin’s three Symphonies for New World Records, 093228050223 (1995) and his one-acter The Caliph for Centaur, 044747250427 (2010). Whether it is tempting to explore more of Scarmolin’s music is an open question. This composer and his compositions raise again an old question: how do you listen to music, in relation to its past and future? Do you just listen “as it is”, independent of any awareness of where and how it fits in the line of music history, and it doesn’t matter if you are listening to a piece of Bach or Beethoven or Mahler or Debussy, or to a good pastiche or derivation written today? Would a skillful Mozart 42nd Symphony deserve the same place in the repertoire as Mozart’s genuine works (and is a skillful Vermeer fake by Van Meegeren as valuable as one of the few originals)? Or do you consider that it’s not worth listening to a copy, however skillful it may be, when all the originals are so abundantly available on disc, and that a composer is heir to ALL the music that was written before him and can’t compose as in a vacuum, pretending that fifty or one hundred years of music simply never happened? I am – in matters of music at least; I’d love to have even a Van Meegeren copy on my wall – a fervent adept of the first position, and am therefore inclined to give short shrift to the music of Scarmolin. But if you believe in the second option, then you should find pleasure in this disc – if you find pleasure in the music of those late 19th and early 20th century composers I referred to in the review.